MySkinSpa’s age management skincare treatment in Raby Bay is aimed at helping you to repair, replenish & regenerate your skin so it looks & feels FANTASTIC (not plastic), no matter what your age! Let’s talk a little about the ageing process and your skin. 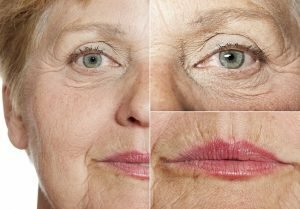 How your skin ages will depend on a variety of factors, ranging from your lifestyle, diet, heredity, and other personal habits. For instance, smoking can produce free radicals, once-healthy oxygen molecules that are now overactive and unstable. Free radicals damage cells, leading to, among other things, premature wrinkles. There are other reasons, too. Primary factors contributing to wrinkled, spotted skin include normal ageing, exposure to the sun (photoaging) and pollution, and loss of subcutaneous support (fatty tissue between your skin and muscle). Other factors that contribute to ageing of the skin include stress, gravity, daily facial movement, obesity and even sleep position. Preservatives and parabens – may not be tolerated and can cause irritations. Perfumes – should be restricted to the skin’s surface only and avoided in creams, which penetrate into the skin. They are the Number 1 cause of irritation of the skin. Emulsifiers – may influence the integrity of the skin barrier and cause the loss of natural protective factors when cleansing the skin. Amines – frequently are accompanying substances of so called anionic emulsifiers and stress the skin especially if they belong to the group of alkanolamines. If it stings or burns, it shouldn’t! 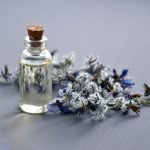 We have been led to believe many things by cosmetic companies and media alike, making extravagant claims about their products or beauty bloggers pulling big audiences on social media (remember they are being paid by these companies) – so we have become very accepting it is ok to ‘peel’ & ‘exfoliate’ the skin on a daily basis. Education is key so let’s talk about your acid mantle! What is an Acid Mantle? 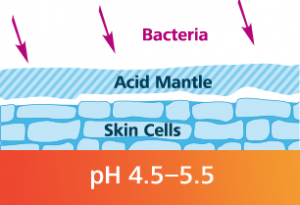 Your skin has a delicate and essential layer called the Acid Mantle (also known as the hydrolipidic film). The Acid Mantle is the skin’s very own defence mechanism against moisture loss and bad, foreign bacteria. When your Acid Mantle is healthy, your skin looks alive, fresh, and radiant. It has no signs of dehydration or fine lines. It has an even texture, your pores are refined and you don’t suffer from over sensitivity. Breakouts may occur, however, they seem to disappear rapidly and without scarring. So why would we ever want to damage such an essential layer? Damaging and destroying the very mechanism nature has given us to keep our skin looking and feeling beautiful sounds bewildering, doesn’t it? When you hear the word “exfoliate,” BEWARE. When your skin feels squeaky clean, BEWARE. The delicate nature of our Acid Mantle compels us to take special care of this essential and powerful skin layer. Let’s realign the way we think about the largest organ of our bodies and the micro eco-system that protects it, which is our acid mantle. We should be nurturing and supporting our skin’s natural function – not looking for the next quick fix by peeling, abrading, exfoliating and scraping it off to achieve a short-term result and in turn creating a long term skin condition! Every treatment starts with a full Clinical Skin Assessment – where your therapist will create not only a customised skincare regime, you will also have a bespoke treatment plan put in place for the next 12 months. You will be completely educated on your skin’s function and current condition. There are no quick fixes with any skin condition, however together we can make a difference – it is never too late to start! Collagen Induction Therapy (CIT) helps rebuild the right type of collagen fibrils. For more information on MySkinSpa’s age management skincare treatment in Raby Bay, please call today on 0438 735 990 or simply fill out the online enquiry form.